I’ve watched this video a couple times now and I can’t help but feel the need to share it. I normally shy away from 65 minute videos, but for some reason I clicked play and paid attention. This, apparently, is Bengt Robbert interviewed by Adam Abraham. My understanding is that Bengt is involved with the ORMUS community in some way and has links to “the spice”, but I don’t know what company it is that produces that product. I’m this was an interview rather than in infomercial! This interview shows a level of understanding with regards to alchemical processes that remove the mystery from studying nature and exploring our relationship in nature. It makes Bengt’s friend’s discoveries personable. You can actually believe that he’s experienced what he states. This is good. If you’ve followed the ORMUS community and feel less than excited about how they share their information, this might change your point of view. I believe what sold me on the video and kept me involved was the early conversation about How to Think. I love the application of mathematical concepts with the process of living. Science should enhance life. This guy makes you feel like YOU could actually have a chance at enhancing your own life through some really simple process – through intention. Pay close attention to the four levels that he talks about in the first few minutes. Data – realm of what questions. Things that can be worked with. Knowledge – operates on data. It is an operator that is applied to data. Wisdom – realm of which questions. How your apply knowledge. Choosing which knowledge to apply. Enlightenment – State of being. Intention determines how wisdom is used. Why questions are answered here. If you’ve got an hour or two, meet Bengt Robbert. Every once in a while this blog brings something fun my way. This time, it was an author spreading news about his passion – his quest for The Philosopher’s Stone. It came in the way of a video and a couple comments on previous articles that I’d written (Is the philosopher’s stone real? And The Book of Aquarius – The Great Work). As you all know by now, I’m of the mind that people really haven’t discovered all there is to discover. Even with things that we think we understand, there still is a lot to learn about it. When you look at the fringe things, even though some things seem weird, or rightfully belong in fairy tales, sometimes the weird is real and fairy tales have substance. I like to use the example, just because you can’t see it doesn’t mean that it doesn’t exist. Can you see radio ways? Can you see salt in a water solution? Can you see the air that you breathe? Well, even though each of these examples are easy to measure (by current standards – you can taste the salt, just not see it), if you can’t measure it, that doesn’t mean it doesn’t exist. Another example would be that we know when something is alive and when it’s dead, but we can’t measure how alive it is. Who is to say that one tree is more alive than another? Do we understand the concept of life enough to really be able to say that the rock is dead? Ok, back on track. This video came to me with all the overtones that you would see with a typical struggling author book promotion. Well, ha, that’s what it is, but fortunately it goes a bit deeper. 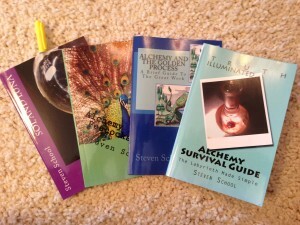 Here is the video (Google or YouTube search “alchemy,aquarius,alembic,aludel,distillation”). It’s really a bummer that it’s just a collection of pictures put to music, but those pictures really do look interesting. Would you agree? I like to support people that have similar interests. That’s really why I put this blog together – so I could share my interests and connect with others that find me. Basically, connect with people that have similar interests. These are concise (less than 20 page) pamphlets that simply lay 99% of it all right on the line. If you’ve studied at all, you’ll recognize just about everything that is written. The true magnetic principle of this salt is often misunderstood, it is not magnetic to metals, it acts as a magnet by the fact that it attracts the universal life force unto itself, the hidden astral spirit which animates all things on earth and thus provides the universal life force to the animated body. The salt acts as a covering for this invisible life force which is the spirit of god. In the case of a tree for example, the wood represents the body, if it contains the invisible spirit or life force, then it is animated and is considered to be alive, however if the universal spirit leaves the tree, then it is no longer vivified, and it is now considered to be dead. This resonates positively with me and has gotten me thinking about the process once again. Yet, I have a feeling that I’ll have to meditate on this for a bit longer. Truth always withstands the test of time. These books are new, so they have yet to prove themselves. I’ve got to include words of caution, for I’ve got an inner critic in me. Every time I see someone claim that they’ve found The Philosopher’s Stone and see that they are selling the information, I tend to believe that they really haven’t. With The Stone, there are better, easier ways of making money without drawing attention to yourself. Even after saying that, these books are interesting. If you pick up these books, reconnect with me and let me know what you think.